Ardley United manager Paul Davis knows his side will have to show more improvement if they are to get anything from the visit of high-flying Thatcham Town on Saturday. Despite an improved display Ardley slipped to a fourth straight UHLSport Hellenic League defeat at Longlevens on Tuesday night, going down 4-1. Ardley fell behind after only two minutes in the premier division game, a long diagonal pass was met by Brad Martin and he struck a left foot shot past Kieran Beesley and into the far corner of the net. The Levens were firmly in control for the opening 20 minutes as Ardley again struggled to keep possession and they went further ahead in the 17th minute. A corner was misjudged by Beesley and the ball was deflected into the net by Ed Smyllie. As the first half wore on, Ardley began to see more of the ball and have half chances but lacked any decisive threat in the box. Andy Prescott skewed his shot wide while Reece Bayliss and Frankie Baigent both failed to hit the target. At the other end both Shaun O’Connor and Scott Montgomery spurned equally good chances to put the hosts further in front by halftime. Ardley began the second half as they had finished the first and Conor Grant in particular began to pose real problems for the Levens defence. His great run and cross gave Bayliss a good chance but that was beaten out by keeper Ollie Hall who also managed to to save Baigent’s follow-up. Grant again surged into the box and this time his cross was almost diverted into the net following a collision between Hall and a defender but the ball drifted the wrong side of the post. However, from the resulting corner Chris Jackson rose above the defence to head powerfully home. The visitors should have equalised but Bayliss could only put his shot the wrong side of the post after being played clean through. Within a minute Longlevens went further ahead after a routine clearance rebounded into the box and was despatched by Ellis Sausman. 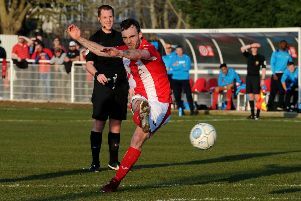 Ardley’s misery was compounded ten minutes later when substitute Ryan Markham lost control in midfield allowing O’Connor a clear run at goal for a chance which he did not waste.